When I’m doing a live stream or attending a convention, one of the questions I’m asked most frequently is which character was my favorite to play on the Angry Video Game Nerd web series. First off, I’ve always been partial to the non-theatrical episodes that focus more on the game, rather than a skit with characters. Don’t get me wrong, I love the character episodes. I just derive more enjoyment out of the episodes that deeply explore the game. When the Nerd really digs deep into the flaws of one game is when I find myself laughing the most. My favorite episode of the show is (probably) Little Red Hood. It’s an obscure game not based off any franchise, so you would think there wouldn’t be a lot of comedy potential or much to work with. But the Nerd explores the game thoroughly, picking out every little detail, completely ripping it to shreds. Another one of my favorite episodes, which is often overlooked is AVGN: Porky’s. Again, this is a game where you would think he wouldn’t have a whole lot to work with since it’s an Atari 2600 game, and usually those game didn’t have a lot to them. But this episode is absolutely hilarious. James was again able to make something amazingly funny without a lot to work with. Anyhow, I wanted to get that out of the way first before I talk about my own character portrayals. As far as the ones I’m in, my favorites are Friday the 13th and Bugs Bunny Birthday Blowout. With Friday the 13th, it was the first time there was ever a theatrical episode like that in the entire series. And it really set up the formula for everything like that to come later. James was the first person to combine a game review with an elaborate skit. And I think it’s this fact that has inspired so many people in the years that followed to follow in his footsteps. Because of James filmmaking background and desire to make movies, he wasn’t only thinking of it as a show to review a video game. He was thinking of it as a form of entertainment. It’s a show first. The review is secondary. When it came time to do the Friday the 13th episode, James had in mind another friend of his. A guy who would have fit the role better because of his body type. I’m about 6′ tall where this guy was probably around 6’5″ and much heavier. A closer match to what Jason Voorhees might actually be like. Anyhow, the other actor was unavailable the day of the shoot, so I filled in instead. I was very nervous to do this. I was uncomfortable with the idea of being on camera. I had done it in the past for another one of James films, but that was a college project that I knew very few people would see. At this point in time the AVGN episodes were getting millions of views, so I was really uncertain if it was the best idea. Anyhow, the fact that I would be wearing a mask is why I chose to do it. All this might be strange to think now, but this is not long after YouTube launched. Things were different then. Over the years I’ve become totally comfortable being on camera. Anyhow, I think the Friday the 13th episode still to this day is one of the best, and is one of my favorite appearances on the show. It’s a toss up between the two, but my other favorite is Bugs Bunny. I probably had more fun filming the Birthday Blowout episode than any other episode. For the fight scene, I was holding the camera while James was throwing punches. He was saying different things like “Take this” or “how do you like that” and so on, as he pummeled on Bugs. I think I said “more like birthday beating” or something like to that effect, which James started laughing at. It was such an awful line, and we both knew it. But we got into a laughing fit over it so he said it anyway, and I can’t imagine that episode now without that line. I love awful jokes. When a joke or a line of dialogue is obviously really bad or unfunny, that’s when I decide to keep it! I used to do a webseries called “Mike’s Game Glitches” where often I would make a really bad joke on purpose. When I see other people doing this in videos, they might add a cymbal crash after the bad line, but I have always felt pointing it out ruins it. If after James said “More like Bugs Bunny’s Birthday Beating” he said “what a bad joke!” it would have killed the moment. That is my sense of humor in general, which often times people don’t get. I can understand that though, we have a worldwide audience and sometimes humor doesn’t always translate well from culture to culture. I played many other characters on the show. Leatherface, Michael Myers, The Joker and more. I also have reprised my role as Bugs Bunny multiple times. 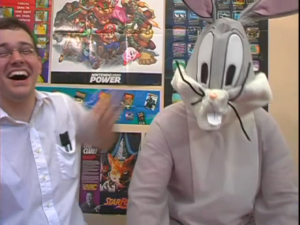 I had a good time doing all of those parts, but I think the final result worked best for Friday the 13th (AVGN Episode 12) and Bugs Bunny Birthday Blowout (AVGN Episode 31). Those are my favorites. Hey Mike, do you plan on continuing the glitches series? I really enjoyed those videos. 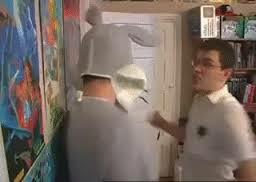 Did you appreciate getting shat on while in the bunny costume? That one in particular was bad because the chocolate and peanut butter went up my nose and I couldn’t breathe for a minute. Yikes! This was a great behind the scenes. Thanks a lot! ? It’s so cool that I own the Friday the 13th episode in the His Name Was Jason DVD. Was that the first time you and James appeared on a DVD? And I too would like to see Mike’s Game Glitches or any other videos like it to make a return to the channel. While I do like James & Mike Mondays and AVGN episodes, those other videos you made while James was away making the movie were really cool. I’m not sure right now about Mike’s Game Glitches but I’d like to get back to regular reviews sometime soon. Thanks for visiting the blog! 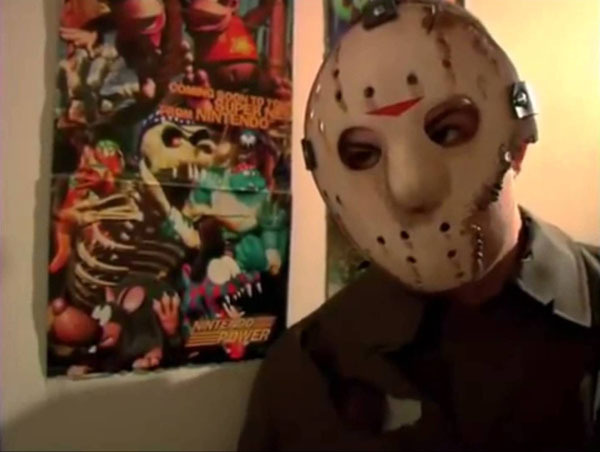 Is the first film you were in with James “It Came From The Toilet” that is my favorite non AVGN project that you and james have made over the years. You two will always be my favourite internet celebrities out there. Way more entertaining than anything Hollywood has produced in recent years. I’ve always thought your party as the lion in the Wizard of Oz video was the funniest stuff you’ve done. Just that goofy face at the end makes me crack up. 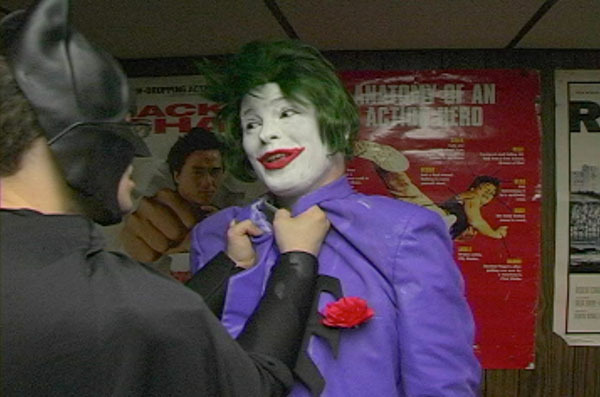 My favourite Mike appearance will always be the Joker – the Batman episodes are two of my favourite AVGN episodes. The Lion in the Wizard of Oz was another amazing job you didn’t mention, but Bugs Bunny is my personal favorite, both always have me dying of laughter. Great to read your personal perspective about the character, too! Awesome blog! I loved the donald duck themed reviews and also the looney tunes ones. I suggest you to play bugs bunny lost in time and also bugs bunny and taz time busters (this one has a two players story mode you should try it with james!) both for PS1! I really dug your Game Gear memories video the most over the years. Here’s hoping to see you shed some more Game Gear love in future vids! I played Donald Duck Lucky Dime Caper not too long ago on Plays. Curse of Issyos,Castlevania:The lecarde chronicles -PC indie. Interested in that Castlevania one. I’m sure we’ll be getting to Panic Restaurant at some point! Hello, Mike! Why aren’t you or James ever talk about the ‘Phantasm’ movies? It is very interesting to know, what you are both thinking about the final 5th movie and series in general. the concept of making of all these movies is very related to James as a filmmaker (good ideas + low budget + a lot of talented friends).